One of my favorite places to show friends visiting Geneva for the first time, are the Smurf Buildings. I always enjoy their first question after they lay their eyes on them; ”Why did you show me this?” Well because I think they look awesome, that’s why! Just above the Grottes neighborhood behind the train station, it’s not too hard to guess how they got their name. 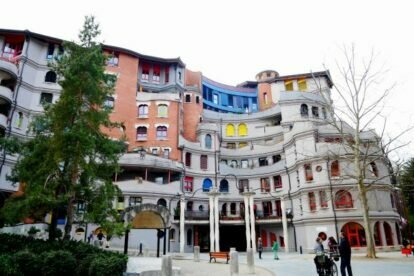 Built between 1982 and 1984 by three architects working together and inspired by Gaudí and the smurf houses from the comics, they are home to 750 families. The complex has a kindergarten, dental clinic and a couple of cafés, all centered around trees and playgrounds. It seems like a wonderful place to live; peaceful and quiet. I have often found myself staring at my favorite balcony, the one that looks like it belongs on Tatooine, wondering what the apartment behind it looks like. Yes, Tatooine. That part of the building looks like it was made from sand. There are also a couple of concrete animals, a big frog, spiralling staircases, equally spiralling columns and other organic looking balconies that seem to want to eat the house. Organized chaos, is what it looks like. It’s probably why I like it so much.